On our recent trip to Disney California Adventure at the Disneyland Resort, we had a dinner at the Carthay Circle Lounge. NOT at the restaurant, but downstairs in the lounge that doesn't require reservations. We waited in a short line, then were lead into the outer lounge space - that doubles as kind of the lobby - for the upstairs restaurant. We were *just* outside of the formal lounge, but had nice plush chairs and a little table. Nat had a cocktail, I had a beer flight and we ate a bunch of the small plates. But, none of that was the star. Nope. That's because right beside our table was a display case that had all these Donald Duck products in it. And if you look closely, the consumer products are all in almost perfect mint condition. There's Cheese Quackers from Nabisco that has a nice Donald Duck-tie-in. But then there's just a bunch of random products that they appear to have slapped the Donald Duck name/brand on. I mean...Tomato Juice? Grapefruit Sections? Tomato Puree? Pinto Beans? There are some kid-related items that seem to make more sense like Ice Cream and Root Beer and Cola. And even Orange Juice. 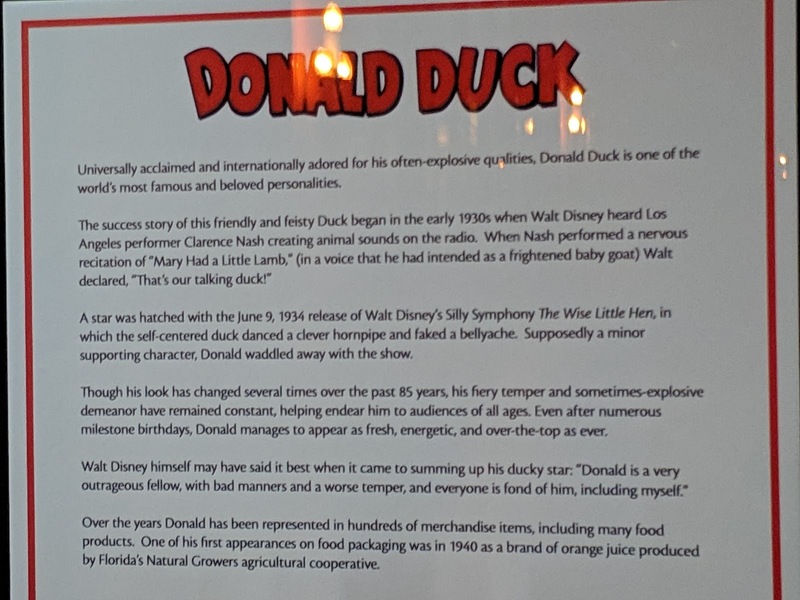 Over the years DOnald has been represented in hundreds of merchandise items, including many food products. 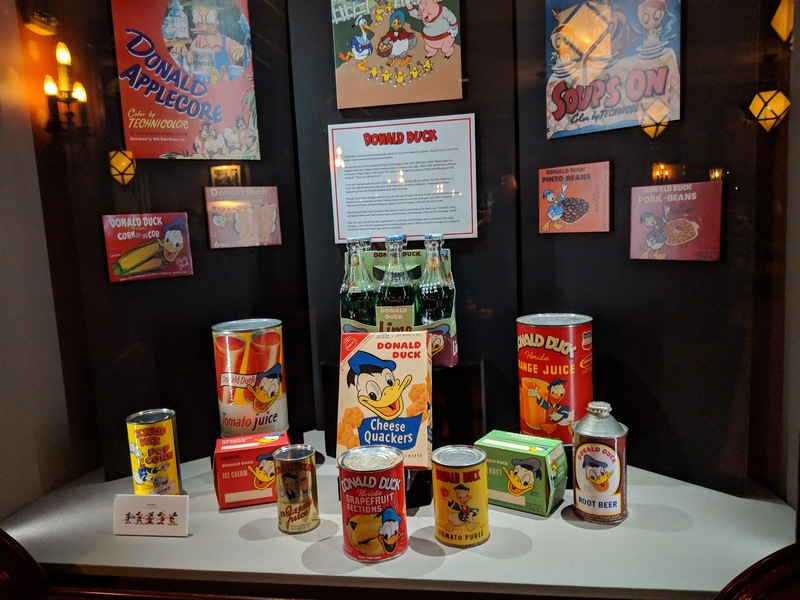 One of his first appearances on food packaging was in the 1940s as a brand of orange juice produced by Florida's Natural Growers agricultural cooperative. Well...that's kinda interesting, isn't it? He was a kind of mascot for the Florida Growers coop in the 1940s. Later on, we know (and I've covered) how Disney created the Orange Bird as a mascot for an organization that seems awfully close (The Florida Citrus Commission) in exchange for them sponsoring the Tiki Room at the Magic Kingdom at Walt Disney World. We had a great waiter who pointed out the display (and the camera and other security measures in place in/around the display) and how it gets swapped out from time-to-time. He mentioned that every once-in-a-while, on a random morning, they'll come in to discover that the artifacts have been swapped out and replaced with a new display. I was able to confirm that this display is from the Walt Disney Family Museum via a couple of posts and that it seems to be a rotation of sorts. Although the new Carthay’s three main spaces are all set in the same period, each has a different theme and feel. The first-floor public lounge celebrates Disney and studio history, with details that recall the original Carthay Circle. Ceiling lights are inspired by that theater’s lobby; a mural recreates the Donner Party scene that embellished the old theater’s curtain. There’s also a museum-quality display case that will hold a variety of authentic Disney memorabilia. ...Other parts of the lounge include a shadow box filled with memorabilia provided by the Walt Disney Family Museum in San Francisco. The items change out every 3-6 months with a new theme so each time you visit it will be different. It is a nice touch to have the display rotate out, but I also can't help but wonder if they're using this small window display to think about and create small little micro exhibits that can travel beyond the museum and even Disney California Adventure? I'd love to see more of this stuff at other parks. Wouldn't you?